Burn on big river, burn on. Burn on, big river, burn on.Now the Lord can make you tumble, and the Lord can make you turn,and the Lord can make you overflow, but the Lord can’t make you burn. For the last few weeks, residents in, and around Charleston, West Virginia have been without drinking, cooking, and bathing water. Freedom Industries which stores a chemical to clean coal had an illegal and hazardous discharge into the Elk River. The discharge occurred up-steam of the West Virginia American Water plant; the largest water provider in the state. The spill affected approximately 300,000 people. Most people understand how dire this situation is, but for a moment, calculate out EXACTLY how our lives would change without everyday water for a prolonged time; imagine it in detail besides just having something to drink. How do I make coffee? How do I bush my teeth (and don’t say beer)? How do I wash my clothes? If these things aren’t tough enough for the modern person and family on the go, now imagine squeezing time to go stand in line for water from a National Guard truck, or to round-up the proper containers to hold the water. Not easy? That’s the proverbial understatement. Besides the inspiration for another great Randy Newman song; not many would agree that a large body of water ablaze is a good thing. It would seem odd living on a planet which is almost 75% water, that finding something clean to drink would be a problem; but it is. The problem is not just for the United States, but the world over. Eventually when the smoke, and chemical haze cleared; literally, there stood a “new sheriff in town.” In 1970, the EPA was formed, and the badge it carried was the Clean Water Act, which actually followed in 1972; lighting speed for a bureaucracy. The CWA was not the first time action was considered. 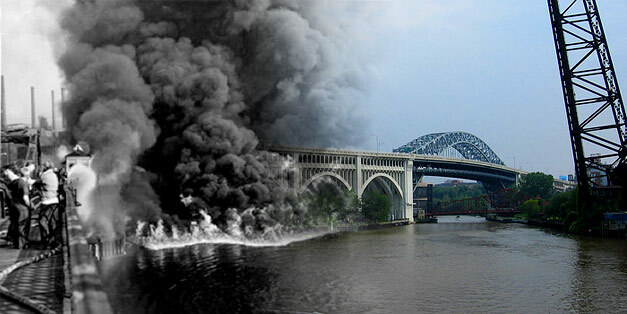 The Act evolved not as brand new legislation, but as an addition to an existing regulation; The Federal Water Pollution Control Act of 1948. Initially, the EPA was not so popular within many sectors of America; much of that has not changed. As mentioned before, I am technician in a modern power plant. To not mention this again would be self-righteous. I am well versed in water, and air quality; regularly “living the dream” of PH, conductivity, turbidity, Nox and CO. I’m for clean air, and clean water; not because I’m paid to be, but because it only makes sense to be. Though present day power generation is not perfect, my co-workers and I are privileged to operate one of the “cleanest” facilities in the world; a job we consciously carry out with diligence. My point here is not self-rationalization, or chest bumping. I have seen EPA, and local environmental regulations up close and know that compliance can be frustrating, cumbersome and ambiguous on a good day. There are people who work for the EPA and environmental firms who would agree. This doesn’t mean all regulations should be abandoned. There are more than a few in industry as well as people, and groups here in the U.S. and around the world that spend excessive time, money, and energy opposing environmental initiatives rather than attempting to comply. I can hear the whiney voices now; “how come China doesn’t do it? We’re tired of those tree-huggers wrecking out lives. Just more government intervention; I don’t like the new fries at Burger King, and Wendy’s (oh sorry, the last one; that’s a completely personal whine) blah, blah, blah. When was the last time Americans spent days walking around with masks to protect their breathing ability like they do regularly in Beijing? Sure, sure, there was that “slight burp” from Mt. Saint Helen’s a few years ago, but you can take that up with God. The bottom line is a dire line; people and the planet they live on are directly connected. You can’t abuse one without abusing the other. It’s not about “going green,” living on nuts and berries, or taking up a grunge lifestyle. It’s about drinking without fear when you’re thirsty. Being one of Zulu coworkers I can concur with his very well stated opinion on this. I am so glad I discovered your site. Good stuff. I have worked with him for a few months now and his post describe his character perfectly, a great writer and thinker. Worked with this man for a few months and his post are exactly who he is and how he thinks.